The Foundations in Public Participation program was delivered in July 2018 in Jakarta using the new Bahasa student manuals. Bahasa is the national language of Indonesia, and the bilingual Bahasa-English speaking participants appreciated having course materials in the Bahasa language. Preparations for the training began in late winter 2017, when the Federation Board approved a team of highly qualified IAP2 Indonesia members and supporters to translate the Foundations course materials. The team was led by IAP2 Indonesia Chair Aldi Muhammad Alizar who was ably assisted by fully qualified translators and members Ratih Damayanti, Anton Febian, and Dewi Arilaha. In addition to translating the student manuals, the team also translated the case studies and exercises that would be used in the training room. The translation team ensured all translated materials would be culturally appropriate. Indonesian case studies were researched and developed to support the training. The key “takeaway” for trainers and consultants working with multi-lingual groups is to be prepared to engage the participants in adapting the materials and to seek participant input. Throughout the delivery, the materials continued to be adapted to be relevant and appropriate for the Indonesian culture. During delivery of the course, trainers Barbara Chappell and Tanya Burdett modified the schedule to allow participants sufficient time to translate instructions from English to Bahasa and to translate participant feedback from Bahasa to English. Providing time for this multi-cultural experience resulted in a richer experience for all participants. Another important cultural adaptation was to schedule sessions to accommodate participants’ prayer times. The training concluded Friday afternoon with a celebration, including presentation of certificates and much picture taking. It was both a sad and happy time. 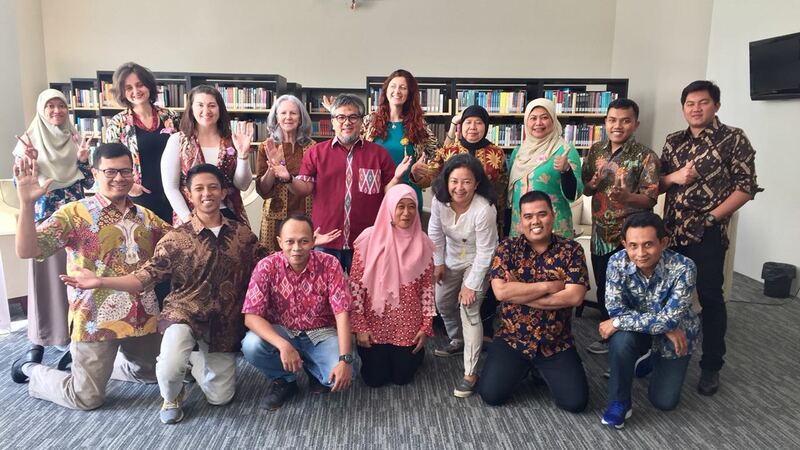 We were sad to say goodbye to our new friends and happy that 14 people in Jakarta had completed the IAP2 Foundations in Public Participation program. Success was due to the collegial, collaborative relationship among the IAP2 Indonesia team capably led and managed by Aldi Muhammad Alizar; the two trainers, Barbara Chappell and Tanya Burdett; and IAP2 Federation’s Professional Development Manager, Cassandra Hemphill.